Opals have captured the fascination of gem lovers since antiquity. The oldest known items featuring opals were found in ancient Mayan and Middle Eastern jewelry thousands of years old. In the middle ages opals found in central Europe became one of the most prized of gems. For the majority of its history opals were known as good luck gems because they contained the colors and spiritual powers of all of the gems combined. It wasn’t until Anne of Geierstein, an 1830s novel by Sir Walter Scott in which the unlucky heroine is given an opal hair ornament, that opals were thought to be unlucky. When opals were discovered in Australia they quickly became one of Queen Victoria’s favorite gems and she wore them constantly to prove to her superstitious subjects that the stones were not unlucky. To this day there are those who believe that one can only wear opals if they are born in October- but we have certainly never seen any ill effects from wearing and enjoying gem opals. Technically speaking, opals are hydrated silica- or a glass-like substance containing water. The silica molecules form tiny orbs with water in between them. The small orbs capture light, and the light reflects back out through the trapped water, resulting in the play of color. This phenomenon is similar to seeing a rainbow or flashes of color when the sun hits a pool of water. The different colors and patterns within the opal are due to trace impurities and how tightly packed the little orbs of silica are. Opals are known as an amorphous gem- they don’t form preset crystal shapes, but take the form of their environment. In Ethiopian stones the opal forms inside a thunder egg, similar to agate (see below). In Mexican and some Australian stones the opals formed in cracks of pre-existing rocks, so they look like veins. Some of the coolest opal specimens come from Nevada and Oregon, where the opal replaced the wood in petrified wood, and in southern Australia some opals form in the shells of long extinct sea snails and clams! Grading opals is an extremely complex science. Ultimately there are 5 factors influencing value: 1) Size and shape- larger opals are more rare than smaller ones and thicker stones are more durable for ring mountings. Oval or round shapes are a little pricier than fancy shapes or freeforms because they fit in more mountings. 2) Background or base color- generally the darker the background color the more expensive the opal because dark grey or black backgrounds make the color play stand out. That being said, some crystal opals can be as valuable if the color play is super intense. 3) Colors present in the opal- while red is the rarest single color in an opal, the most valuable stones have all of the colors of the rainbow present. 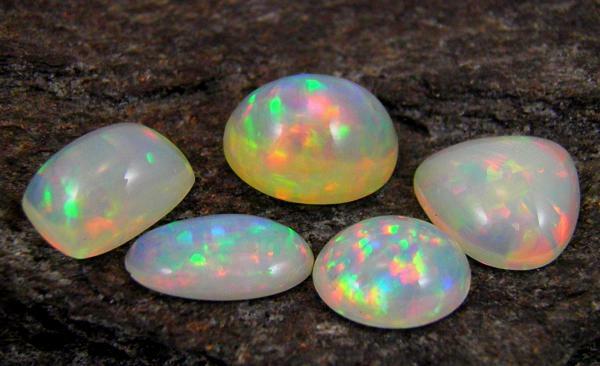 4) Brightness or intensity of color- a good opal should have lots of color and life. This means the colors should be intense (red is more valuable than orange) and very bright (you shouldn’t need bright light to see the color). 5) Pattern of color play- the best opals have broad flashes of color covering the entire surface of the opal. Rare patterns such as square blocks (Harlequin), puzzle piece pattern, and “Chinese Writing” are rare and unique, so collectors will pay a premium for them. It is important to note that opal pricing is subjective, since every gem is different, and every buyer has different tastes. So long as you buy what you like you should get lots of enjoyment from your opals. In early 2008 a farmer in the Welo province of Ethiopia stumbled upon a rock that looked like a thunder egg. When he cracked it open he discovered that the interior of the rock was solid opal! This discovery started a mining and exploration craze that has changed the opal market forever. The opals were found in veins running along a ridge and the area quickly flooded with prospectors looking for their next claim. The first opal region they discovered produced a unique color of opal where the background color was brown- from a warm coffee brown to a dark almost chocolate brown color. These opals were unique in that they had a predominately red play of color (the most rare color in Australian opals) mixed with green flashes. Pretty soon this discovery had been exhausted because the limited supply could not meed demand. The miners moved on and landed on an area that produces white opal material that has some of the best color play ever seen in opals of any kind. Some of these opals are opaque and white with color play that is nearly identical to Brazilian and Australian white opals, but the stones that are really making waves are the crystal opals. These gems are colorless and totally translucent- meaning you can see through the gem. Trapped within this “crystal” is an unparalleled display of spectral colors. Some of these gems have pin fire- thousands of tiny dots of color, while others have broad flashes of color. The quality of these opals is simply mind boggling- and is far prettier than the commercial quality white opals found in most jewelry stores, and at very reasonable prices. When we buy Ethiopian opals we look for stones that make us say “wow!” Unlike the Australian opals, most top quality Ethiopian stones have all of the colors of the rainbow present and one doesn’t have to pay a premium for reds and oranges. Additionally we have seen some very unique color patterns that one can’t find in other material, so we tend to buy these more unusual stones. We also look for opals with size, since 5 or even 10ct stones are occasionally found and are not yet cost prohibitive. Recent magazines and fashion labels have been highlighting these Ethiopian opals in new designs, and we too have had fun playing with designs to focus on these stunning opals. The opals from the outback of Australia have been the crème-de-la-crème of opals since their discovery in the late 1800s. What made this discovery so unique was that the opals were not the classic white background with small patches of color over the top. Instead the host rock where the opal formed was opaque grey and black, making the color play on the stone stand out more than in any other opal. Furthermore the opalescent quality of the material was higher than had been seen from other sources. The Lightning Ridge mine became famous for true black opals. The most plentiful colors in these gems are green and blue but many opals from Lightning Ridge can also have a strong orange and red flash that is exceptionally rare. It should be noted that instead of small pinpricks of color these opals tend to have broad flashes of intense colors across the face of the stone. Lightning Ridge opals are one of the scarcest colored gemstones on the market, so we are carrying less of them now than in the past. We still have fun with them but often in smaller sizes or unusual shapes to keep the prices more reasonable. Stones from Andamooka and Coober Pedy are more available, but they don’t often have the dark background color. From these locations we get good quality white opals and boulder opals. Boulder opals are stones in which the opal grows in veins within the matrix of the host rock, and then the stone is cut to include a portion of said host rock. These stones have a more organic look to them that make them useful in more artistic jewelry design. When we buy black opals we look for gems that have a dark background and a color pattern that is even and colorful from every angle. We don’t discriminate against any particular pattern or color- we think all black opals are beautiful whether they are more blue-green or more red-orange. We can get top gem opals that have equal blends of all colors in a bright pattern- but these are one-of-a-kinds that we bring in on memo for our clients to view. We are less picky with our boulder opals because these stones are less about the colors, and more about the pattern and shape of the overall piece. The photo at the top of this page shows a grouping of extra-fine Australian black opals from one of our our favorite suppliers, Cody Opals. These particular stones show a variety of color patterns and background tones, from black to white, but they are uniformly bright- the hallmark of a good opal. Even though there is a tendency to compare Australian and Ethiopian opals, they are very different and deserve to be judged based on their own merits. As we say, our clients should buy what they enjoy, and we recommend looking at the opals from all localities with an open mind.